In the field of histopathology, pathologists diagnose patients by assessing imaged tissues based on years of experience of looking at similar images. Even with the pathologist’s trained eye, there is a considerable risk for misdiagnosis [1,2]. In such cases, patients receive unnecessary or suboptimal treatment for their disease. On top of that, the cost to the society is considerable. For over half a century, tissue samples have been sectioned and stained with haematoxylin and eosin (H&E) so that pathologists can visualise the morphology of cells. For more than thirty years, immunohistochemistry (IHC), an antibody-based staining technique, has been used to indicate the presence of specific proteins within different tissues, types of cells or cell structures. It is common to detect a protein using a DAB chromogenic stain and combine it with a single counterstain to visualise cell nuclei, normally haematoxylin. Fluorescent IHC techniques generate a more quantitative readout but suffer from photobleaching (the tissue can only be imaged a limited number of times before the fluorescent dye is rendered unusable). 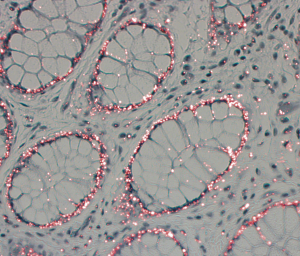 Lumito’s proof of concept nanocrystal reagent can be applied to immunohistochemistry. The assay builds on many years of experience and is developed by Lumito’s partner TTP, a leading independent technology and product development company, in collaboration with BioIVT’s PHASEZERO service team, which specializes in IHC studies. It is designed to substantiate, beyond any doubt, abovementioned claims. 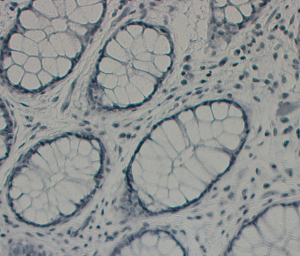 Formalin-fixed paraffin-embedded human colon was sectioned and stained by BioIVT using standard staining equipment (autostainer), then transported to TTP where it was visualised in Lumito’s proof of concept imaging instrument. The assay focuses on epithelial cells in the mucosa by employing a commercially available primary antibody that targets the protein family of cytokeratins. Specific binding of primary antibody was detected using a secondary antibody, that, in turn, is linked to the nanocrystals or horseradish peroxidase (HRP) enzyme (followed by DAB chromogen). Figure 1. Brightfield image with haemoxylin stained nuclei (blue-green) and epithelial cells stained for cytokeratin (DAB brown chromogen). The image quality is limited by the very early instrument prototype. 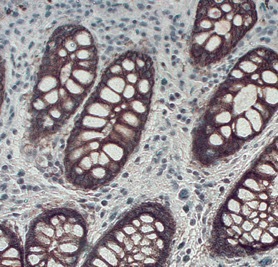 In Figure 1, tissue stained with pan-cytokeratin antibody and visualised with DAB gives the expected result of brown colour in and around the epithelial cells in the mucosa. This is a high-quality DAB stain, however the impreciseness of the colouring should be noted. Figure 2. Brightfield image of human colon counterstained with haematoxylin. The image quality is limited by the very early instrument prototype. Figure 2 shows a brightfield image of the tissue stained with haematoxylin and nanocrystals. Figure 3. 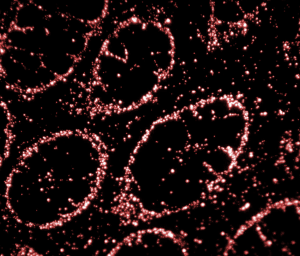 Luminescence image of cytokeratin (red/white) detection using nanocrystals. The image quality is limited by the very early instrument prototype. In Figure 3 is the luminescent image of cytokeratin expression in a tissue stained with haematoxylin and nanocrystals. These data are acquired independently of the cell and tissue morphology in Figure 2 but can easily be merged to provide a guide for the eye (Figure 4). The separation greatly speeds up diagnosis by highlighting areas of interest within the tissue section. Figure 4. Brightfield image of haematoxylin stained nuclei (blue-green) overlaid with luminescence from nanocrystals (cytokeratin; red/white). Please note that the colours used to show the luminescence signal are purely user’s choice. The image quality is limited by the very early instrument prototype. Figure 4 presents an illustration constructed by overlaying two imaging modalities, luminescence and brightfield, of tissue stained with nanocrystals and haematoxylin. The colours used to indicate the luminescent signal can be freely chosen by the user. The conclusion from the study is that the assay fully supports the above statements and that the proof of concept work thereby is done.